On 8th January 2017 (Sunday) morning, Tollywood’s most popular filmmaker Raj Chakraborty walks for a good cause on Kolkata Road along with other famous film and television celebrities. Yes, in an event named 'Colour Walk' organized by ‘Cancer Awareness Society And Supertron Foundation’ (NGO) to spread awareness about ‘Cancer’ in Kolkata; director Raj Chakraborty, actress Subhashree Ganguly, Saurav Das, Bidula Bhattacharjee and many other celebrities walked in support. 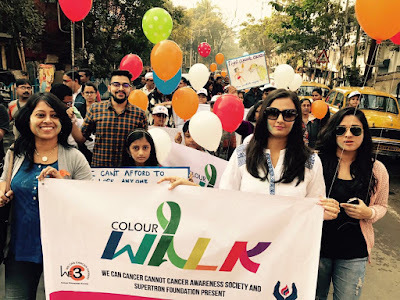 Here are few pictures of ‘Colour Walk’ cancer awareness campaign presented by ‘Cancer Awareness Society And Supertron Foundation’ with a motto ‘We CAN Cancer Can NOT’. Tollywood Bengali film actress Subhashree Ganguly joins Colour Walk [We Can Cancer Cannot] Cancer Awareness Event on 8th January 2017 (Sunday) in Kolkata. 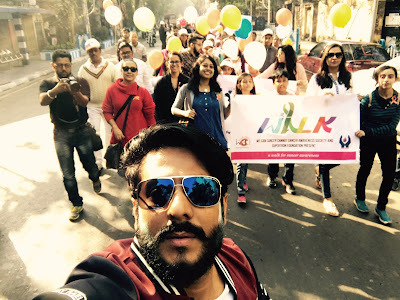 Bengali film Director Raj Chakraborty and other Film & TV stars walked with a Social Message in Colour Walk Anti-Cancer Campaign in Kolkata - We Can CANCER Can NOT.